Paradise Air Inc is proud to serve the Grapevine community! Located primarily in Tarrant County, Texas, Grapevine has a population of nearly 46,500 residents, and it was named after the native grapes that are found in the area. This community thrives off of the tourism industry, with visitors arriving at the city’s largest employer, the Dallas/Fort Worth International Airport. Other major employers in Grapevine include UPS, the Gaylord Texan Resort Hotel & Convention Center, and Baylor Medical Center. This city is part of a humid subtropical climate zone with hot summers that typically reach the mid-90s. Winters are mild with temperatures in the low-50s. 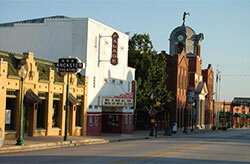 Grapevine is a major tourist destination and offers a variety of things to see and do. Grapevine’s Great Wolf Lodge and Gaylord Texanare two large resorts in the area that also serve as massive entertainment complexes. Visitors often enjoy checking out Grapevine Mills, which provides opportunities for shopping in addition to housing an ice rink and movie theater. The Grapevine Vintage Railroad allows visitors and residents alike the chance to explore the history of the area, and other notable attractions include the Grapevine Opry and Delaney Vineyards.